I got attacked by a new story about three months ago. It’s a YA Paranormal (those of you waiting on the second Bound book, don’t worry I am working on it but right now I’ve hit one of those hurdles) and though I’ve been really excited about it, I’ve only written about 10,000 words in three months. Granted, some of that was because the garden produce launched a full scale war on my kitchen and had to be subdued into the canner and the freezers. But a lot of it was because I wasn’t really sure how it was going to do what I wanted it to. So I did something strange and unusual. Something I have never done before. I started outlining and plotting. At first I wasn’t sure my brain was going let me work that way. It’s usually very stubborn. And anyone who says I should be able to control my own brain has obviously never been inside my head. It started with me working out the situation in the book, why things were happening, who the bad guys were and what their motivations are and such. Okay, this part was easier to do since I did this for my other books. After getting the initial introduction to the story down and meeting my characters, I usually step back to find exactly what their story is all about. But I wanted to take it a step further. I wanted to quit wondering what I should be writing next, where I should be taking the story next. I wanted to quit having to go back and delete and rearrange things because I realized I had written it wrong or in the wrong order. It was time to try to be organized a little. Something I am NOT good at. Post It notes all over the wall of a room in my house, one without a lot of traffic so they wouldn’t get knocked off the wall. I started scribbling down a brief overview of what should happen in each chapter. This sometimes took two or three sticky notes for a chapter but that was okay. Once done, I had the entire outline plotted out. Once I was finished, I let it sit there on my wall for a couple of days while I let the story, now that I knew far more about it and what was going to happen, percolate in my mind. I shared the above pic on FB and Twitter. Some people mentioned Scrivner. I had tried Scrivner for a couple of days quite some time ago but at the time found it too complicated and convoluted and returned to the simplicity of Word 2010. But Word wasn’t going to work for this project, not entirely anyway. So I re-downloaded the free trial of Scrivner, read the tutorials which taught me how to use very basic functions before becoming useless. Needing to know how to do more things, I took to You Tube and found a couple of great vidoes on how to work things. Sometimes it’s just easier to see someone do something when trying to learn rather than reading about it. Once I had a firm grasp on setting things up and using the cork board function, I went to work. Now, I’m sure I’m not using Scrivner to its fullest extent or even the way a lot of people probably use it, but hey, it’s working for me. 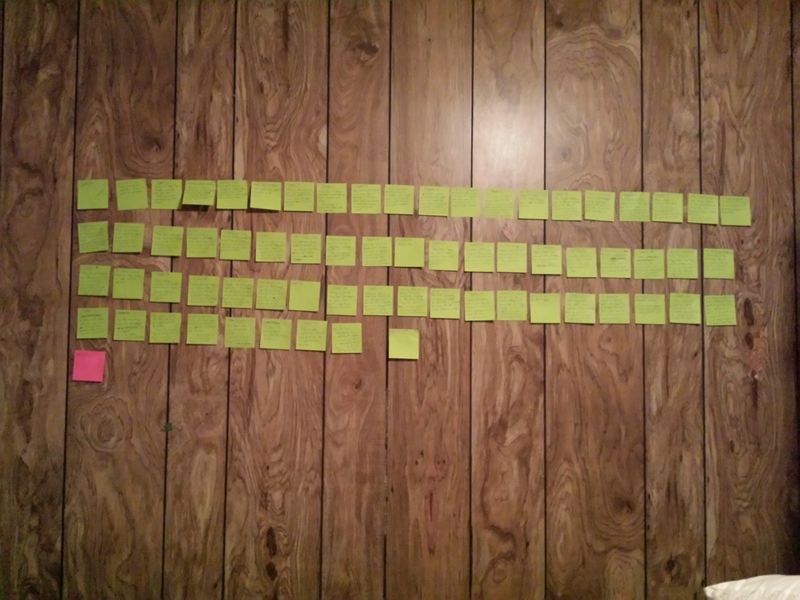 I started transferring what was on my sticky notes to my cork board on Scrivner, this sometimes meant I needed to use more than one note card per chapter. And I know technically that isn’t how you’re suppose to use it, but my mind is ever complicated, I blame it on the genes I got from my engineer father. Because I had let my outline sit for a few days while I learned Scrivner, had a melt down because I couldn’t figure out how to adjust margins or line spacing and then celebrated when I accidentally stumbled over how to do it on my own, I was able to look at it with fresh eyes. I could easily see where things needed to be adjusted to fit what I wanted for the first book in the series. Once I was done, I had the book broken down into three acts, each act folder had ten chapters worth of cards of on the cork board. The cards now contain a basic over view of each chapter from start to finish. I am now working on the outlining the second book. Once I have all three outlines, I will return to the actual writing. And honestly, I’m exhilarated by my first foray into outlining. I can now easily see where things are going in the story. Does it mean I can’t deviate from the outline? No, not at all. In fact I made the outline in such a way that my characters are free to add in things they think should be there as we get further into the story. Most if it is very general which allows me to expand on a chapter as much as need be while still having the bones of the map to follow. Will I write all of my books this way from now on? I’m not sure. My brain is still resisting the idea of using this method for my fantasy books. However, I would really like to talk it into outlining those if I can do so. It will make writing the fourth book of Dragon’s Call move much quicker, which is something I know many of you would be pleased about. All I can say is I will do my best. Honestly, I think if I can continue to wrap my brain around the idea of organization, I will be far less frustrated with the writing process. And, just in case the Disorganization Gods are worried I’m going to forsake them, never fear. This only applies to my writing. I promise to maintain the teetering stack of papers on my desk as your shrine, I will still run late, I will still forget where I put my purse and shoes. I promise to still scribble the very first story notes in whatever notebook is close at hand until I have to go on a frustrated search through them all to find all of the various notes so I can make sense of everything. But eventually, I really do think all of those notes will end up in Scrivner and the books will be mapped out before I embark on the journey that is writing them. From pantser to plotter, who knew it could happen. I feel like I’ve just read about my last 12 months. I’ve had Scrivener forever, but didn’t use it for pretty much the same reasons as you, and stuck with Word. Out of desperation I fired it up about a month ago to help me get past the ‘what happens next’ hurdle. I’m still way behind with all my writing, but it’s helped me slowly get back on track. Gook luck with your writing. I’m way behind on my writing too. At least this is helping me catch up. Your post really got me thinking, and I’ll be linking to this post from my own blog. Hope that’s ok.
I’ve place a link to this in my latest post. I did plot to some extent in my mind, but it was all very fuzzy. This makes things so much clearer.